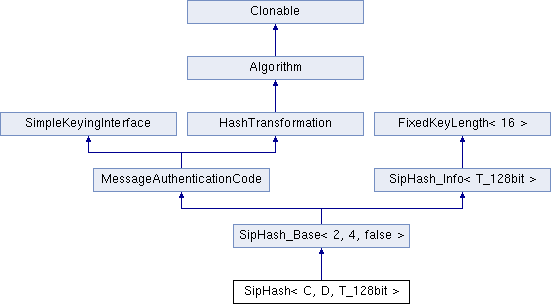 SipHash computes a 64-bit or 128-bit message authentication code from a variable-length message and 128-bit secret key. It was designed to be efficient even for short inputs, with performance comparable to non-cryptographic hash functions. To create a SipHash-2-4 object with a 64-bit MAC use code similar to the following. To create a SipHash-2-4 object with a 128-bit MAC use code similar to the following. Definition at line 141 of file siphash.h. Definition at line 150 of file siphash.h.